∙ Ph.D. dissertation Neighborhood Shopkeepers in Contemporary South Korea: Household, Work, and Locality available online (E-Thesis publications a the University of Helsinki). For printed copies, please contact me by e-mail. The recent events, starting from the North Korean nuclear test and continuing to the recent allegations of the participation of some recently or formerly highly placed Democratic Labor Party functionaries in illegal information gathering (read: spying) for the benefit of North Korea, have deepened the gap between the two main factions in the party, the "National Liberation" (NL) faction and "People's Democracy" (PD) faction. The former, forming the majority in the DLP high committee, for example prevented any formal condemnation of the nuclear test, and allowed only the expression of "regret" in the statement of the party. In the process, tensions were boiling high, and some members of the minority faction stormed out of the committee meeting, using even rather strong language such as kaesaekki. Now the spy allegations have created strife also between the social democratic circles active within DLP (represented by "Autonomy and Solidarity for Social Democracy" and the marxist All Together, appearing in the DLP members' bulletin board. (Not that there had been much chance for constructive cooperation between the two, even though these movements are not really associated with either of the two main DLP factions, and they are not basically divided over the stand towards DPRK, as "NL" and "PD" factions are.) Autonomy and Solidarity published a statement which acknowledged that the authorities (NIS) are not all wrong in investigating the case and demanded that the party cease talking about "oppression by authorities." To this, All Together (which, as I said, in its unconditionally critical stand towards the DPRK government is basically different from the "NL" faction) responded by asking that "are we supposed to surrender to the witch hunt?". The pen name Hyônminokch'a, a member of the executive of "Autonomy and Solidarity," responded by giving a rather nasty description of All Together as playing to the sensibilities of the "NL" faction. It didn't take long for All Together to respond again, showing how insurmountable the divide between the two groups after all is. An interesting piece of info from the latest All Together comment is that one of the Autonomy and Solidarity activists is operating operated a blog, in blog.chosun.com of all places, called T'ado chusap'a ("down with jucheists"). This sounds like the Finnish social democrats' relentless anticommunism from the late 1940s to early 1960s! Väinö Tanner, the biggest noske of them all. 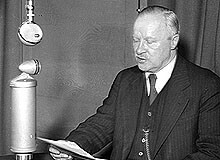 This is his speech (ram) as a foreign minister on December 3, 1939 broadcasted by NBC in the United States. Another interesting thing - the reason why I started to write this note in the first place - was that All Together compares Autonomy and Solidarity to Gustav Noske, the early 20th century German social democrat and the minister of the interior who gained notoriety in putting down the uprising of the Spartakist League in 1919. Here in Finland, "Noske" (or noskelainen) used to be a slur used by communists for social democrats. For reference, a table of the two main DLP factions compiled by Daily NK; note the conservative and anti-DPRK leanings of the newssite when reading the table. La Dialectique Peut-Elle Casser Des Briques? ("Can Dialectics Break Bricks?") is a French "situationist" (see Wiki) film from 1973. Both the Wiki entry for the film and the Youtube entries of a couple of excerpts assume that it's a Chinese (or Hong Kong) film that the director (?) René Viénet has overdubbed the dialogue about the dialectical tactics and radical subjectivity used by the oppressed masses in their struggle against the oppressors. But the film is Korean, and judging from the imagery used in it, North Korean. (Can't be sure, though...) The movie depicts the struggle of bare-fisted Korean peasants against sword-armed Japanese during what must be the Japanese colonial period. struggle. If not I'll send in my sociologists. And if necessary my psychiatrists! My urban planners! My architects! not enough, I'll even send my structuralists. The journal Ilda has an article on a seminar by Peace Foundation (P'yônghwa Chaedan) about the daily livelihood of people in North Korea. • In case both salary and rations are given, it's possible to get by, but these two conditions are rarely fulfilled simultaneously (now that an average monthly pay is at around 3000 won, 1kg rice costs 1000 W, 1kg of pork 3200 W, one head of Chinese cabbage 150 W, and one egg 200 W). • North Koreans' livelihood depends on a large part on trade, which has been the situation for the last 10 years; the upper class deals in high-risk items such as drugs and antiquities, but the risk is covered by the high position and political power. Low class is engaged in all kinds of petty commercial dealings from trading to handicrafts and growing veggies. • a DPRK refugee who took part in the discussion suggested that the sanctions will have the biggest efect on mid-level government (party) functionaries. The poor people have not been relying on the government distribution since the late-90s' famine. The mid-level functionaries in the party or in the security apparatus are highly dependent on the state and on bribes given from below, and the sanctions are likely to affect this structure the most according to the speaker. Here are two newsreels of Andre Kim fashion shows from the 1960s. This one presents winter clothes (link to the page at mncast.com). The text in the beginning, chasôn ûisang palp'yohoe, means "charity clothing show". For someone trying to give an appearance of having an "academic" or "scholarly" blog, hits from .edu domains in the sitemeter help one to feel that way, even if the frequency and the quality of recent blog notes wouldn't support it. Now someone from the harvard.edu googled for my name written in hangul, except that she or he wrote the middle character of my family name as 베 instead of 배 (which is closest to the syllable pä). Must be someone whom I know from my time in SNU anthro dept. 에이, 저렇게 내 이름을 검색하고 블로그까지 들르면 메일이나 보내 주지, 섭섭한데. A news report in a daily newspaper about a one-day sea cruise of the Center Party (the other of the two main government parties) mentioned briefly that a Korean-born person will be among the party candidates in the Finnish parliamentary elections next March. Quite interesting. I won't name names, as I have no intention to endorse the person, but I respect the decision. NAJAKS is short for Nordic Association for Japanese and Korean Studies. A call for papers for the 2007 conference in Copenhagen, 24.-26. August just arrived via email. As the receivers of the notice were requested to assist in disseminating information about the conference, I'll do my share with this blog note. A conference home page will be set up later this year. "Translation" is to be taken in the broadest sense – it is how we interpret and explain different cultures in our scholarly projects, whatever our disciplines. We are "translators," not only when we literally transport and transform one medium into another. We also interpret and explain the forms and figurations of cultural phenomena at different levels: to students, to colleagues, or to the public at large. The manner in which we render words, concepts and worlds into our own language depends on many factors: power relations, ideology, religious beliefs, disciplinary constraints, and other things of which we may not be completely aware. Proposals should be submitted directly to the convenors. Proposals not relating to the conference theme are welcomed; however convenors may give preference to papers relating to the conference theme, if they receive more proposals than they can accept. I separate document for each of the sections accompanied the mail; from those I have only included the email addresses of the session convenors. The deadline for presentation abstracts in all sessions is February 1, 2007, and notions of acceptance will be mailed at around April 1, 2007. I have downloaded on Youtube the snippets of a documentary video about Seoul marketplaces (linked to in this earlier note of mine), called "Sounds of the Seoul Marketplaces" (Sôul Sijangûi Sori, 2004) and produced by the Seoul Museum of History. I will download the video nr 5 as soon as I get it into two pieces, as it's slightly over the 10-minute limite that Youtube has. Here's a direct link to it in Lee Mon-woong's visual anthropology archive: Seoul's traditional marketplaces.